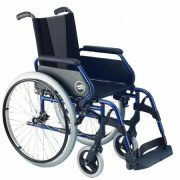 Foldable wheelchair, self propelling with painted steel frame. 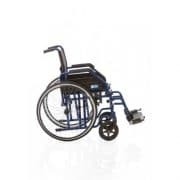 Painted steel stabilizing frame, single cruise, seat and back in black nylon, padded and washable, with back pack pocket.Rear aluminum wheels with spokes, with black PU rubber wheels without air chambers and handrail in black painted steel. PVC front black wheels with steel fork. 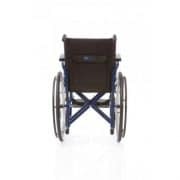 Foldable short armrests with black nylon padding.Removable footrests adjustable in length and a black plastic footboard and heel strap.